I thought the Solstice and the Nomad were both conceived to be built on Kappa? They were. The Nomad was on a stretched platform that is said not to be production feasible. It's still a great idea, but I don't think GM understands just how badly people want RWD vehicles. The automobile supplier Edag presents two new vehicle studies on Detroit car Show, a Pontiac Solstice with combination roof and a luxury UV. 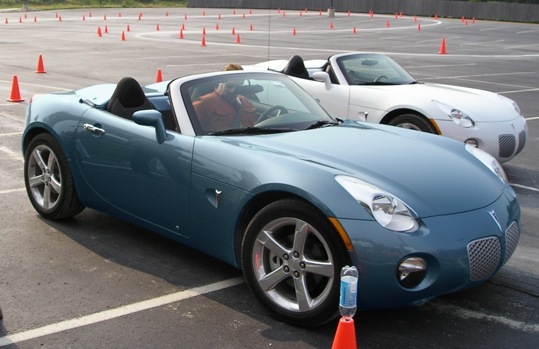 For the Pontiac Solstice, which ex factory with a material stoffverdeck supplied that in the folded back condition under the trunk flap disappears, it has Edag engineers a special Hardtop including a new trunk lid sketched, which does not only offer a firm roof over the head to the driver, but for the vehicle a completely new optical appearance provides, which leans against the Pontiac Safari station Wagon from and the 60 it 50's. Thus an elegant variant of a sport combination becomes from the roadster. Luxury UV as Showcar as the second Showcar presents the enterprise the SUV 2005, a concept from the Roadsterfuer a extravagantes, extroverted and hochpreisiges Life Style Sportfahrzeug of the luxury class. Beit set up muscles over the wheel housings, paired with the roof line and wedge-shaped, substantial set down sidesmolder-learn to set the SUV optically dynamically in scene. Daily know which runs here gibt's the free new type character approximately around car, engine and sport. Last edited by Drex; 01-03-2006 at 04:16 PM. run it through the translator three more times...that should do it! I wonder how much it would cost and how long it'd take to switch the trunk lid with the hardtop. No Friggin way!! This is the exact concept behind my hardtop idea!! Lucky for me they look to only be doing the station wagon look, mine will be a fastback. I can only imagine how heavy that thing would be, just look at all that glass! If they are going to be at the Detroit auto show then I am Definately going this year! From a design and style standpoint I really like the looks of it, reminds me of the Nomad concept from a couple of years ago. Outerspace - ordered 5/27/05, VON#: JFZBN4. Red/blk leather. All options minus 6-dsc, XM & Onstar. Cancelled order 1/30/06. You know, it's not like it's a NEW idea or anything... a hardtop that replaces the decklid. We were talking about doing something similar WAY back before production started. sorry, I forgot to mention the sarcastic nature of my previous post. I see this version as a alternate option, if you dont like the factory removable hardtop or the stock soft top and your not too fond of the fastback there's always a station wagon! Soon enough we'll have all the bases covered. I have never, ever seen a car that transforms from a roadster to a sport wagon. This is no ordinary run of the mill removeable hardtop. It's pretty damn cool if you ask me. Kind of resembles the Z3 coupe, wagon whatever it is. Solves the storage problem for road trips. Maybe if it had a targa top for open air driving and packing it full of stuff. Sure beats the luggage rack/trailer dilemma that has been going on. I just REALLY love the concept that stang and I had our minds set on, a full on decklid replacement that latches into the windshield and slopes back in a fastback style with a rear hatch to have access to the trunk. It's basically like owning the Solstice roadster AND the Solstice coupe without having to have 2 cars. I can only hope somebody bites our idea and runs with it. I'm looking for the hatch to be styled as close to the top of the coupe concept as possible, with a rounded glass for the hatch. Also perhaps with a glass roof. Me like...please mr. german guy, make one. The coupe idea is just plain better! Those Germans got nothing on us...except money... and a prototype. Acctually it looks like they photochopped a preproduction solstice. I dont read German but it doesn't specifically state that the car will be there. Also, it says that it is a design study so that is no promise of production. I'm still going to take a look at their booth, this would be a really cool option! Imagine the number of different cars you could drive around in just by swapping roofs!! It's certainly a lot cheaper than buying multiple cars!